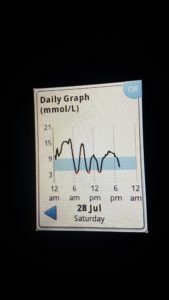 I’ve written about the adventures with diabetes I have had…but never really shown any pictures of what it is like…so I guess I should rectify that. This first pictures was from back in November 2017. I had been working a lot and not eating enough. I was still doing multiple daily injections (MDI) and had not adjusted my dosages of insulin for not eating. Well, I went home, had supper (sort of…bad diabetic) and then watched a bit of TV. After a bit, I started feeling crummy and instead of doing anything bright, I went to bed. 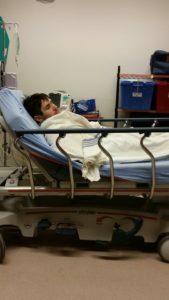 Long story short, my parents found my unconscious (sort of…apparently I spoke to them) and rushed me to the ER in my car, where a couple paramedics, a nurse, and a security guard had to take me into a room. This pictures was from after I woke up and started talking again (cause that was a thing). 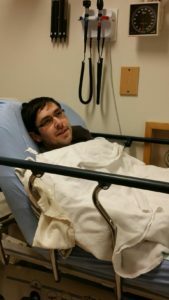 I ended up staying in the hospital for 3 days. Fun times had by all….not. A month later (actually about 3 days before Christmas) I had started adjusting insulin and doing all that fun stuff. But diabetes? It don’t give a flying crap how much you do. Sometimes it just says “Screw you”. This time, I passed out on the couch at some point in the night. I remember going to bed and have no idea how I got out to the couch…but when I woke up, there were 3 paramedics over me, and I had an IV in me. That’s a weird thing to wake up to. So, off in ad ambulance I went…back to the ER. Actually, one of the paramedics was the same one that dragged me into the ER in November. Life is weird. They got my sugar stabilized and after a bit let me out. So home I went. And ate…cause I was not surprisingly hungry. All they gave me at the hospital was a teaspoon of honey. It works….but what a weird texture. And then this…this was Saturday. It was a nice roller coaster day. The good thing? I no have the Freestyle Libre and can watch it go up and down and treat as needed. It does help…although the feeling of a low blood sugar is still the same. And it isn’t fun at all. Something interesting – this was with a 55% decrease in my basal rate on my insulin pump. I’m sure glad I did that. So ya, just a few little pictures that relate to some of my adventures with diabetes. You can always read some longer posts about my adventures here. The Love Of Jesus: Can I Claim It Is For Me? Overdone songs? Maybe. But I still end up singing along.